In the summer of 1976, Peter Rona, then with the National Oceanic and Atmospheric Administration (NOAA), sent a camera 3,700 meters below sea level to photograph the Mid-Atlantic Ridge, as part of his Trans-Atlantic Geotraverse (TAG) project near 26 degrees north latitude. 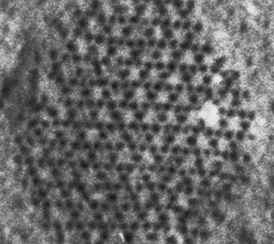 While photographing basalt steps that make up the eastern wall of the rift valley, he imaged a curious pattern in the overlying sediment: tiny holes that looked like the impression of the hexagonal center of a miniature Chinese checkerboard. The pattern, so small it could fit under a poker chip, appeared randomly scattered across the sediment. Whatever creature formed this pattern remained elusive. In 1978  a year after the discovery of hydrothermal vents and their wild communities of tubeworms, crabs and mussels in the Pacific  Peter Rona and his colleague George Merrill, also then with NOAA, published the photos in a report that categorized the pattern as belonging to an invertebrate of uncertain identity. The report put the whodunit question to the geoscience community. Left: Parts from a Chinese Checkerboard lost at sea in the Atlantic? No, but this underwater photo (actual size: 5 centimeters) taken in 1976 and first published in the April 1978 Bulletin of Marine Science has become a fascinating challenge to identify. Right: The same puzzling pattern shot with HDTV in 2001. Just what created this feature remains a mystery, but one theory links it to trace fossils from the Eocene. The Stephen Low Company. When paleontologist Adolf Seilacher of Tübingen University in Germany saw the report in the Bulletin of Marine Science, he recognized the pattern immediately and contacted Rona. 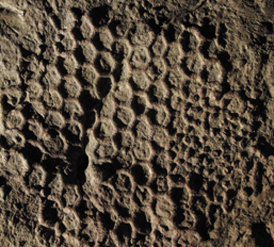 The pattern looked to Seilacher like surface features he had modeled for an ancient creature known only by its tunneling trace fossil: Paleodictyon nodosum. That s pecies left a meshwork of tunnels in the deep-sea turbidities of the Eocene and is part of a group of similar trace fossils that date back to shallow, marine deposits from the Cambrian. Formed a few millimeters below the sediment, the fossilized tunnels included shafts to the water above. In 1985, Rona led the discovery of the first hydrothermal vents in the Atlantic in the same area, which is now known as the TAG hydrothermal field, and has made more cruises to study the region and the mysterious pattern. He has shared his observations with Seilacher and the two of them are piecing together the evidence. But they needed better images. equipped with lights, cameras and humans can illuminate the scene, record the drama and return with stories of deep-sea adventure. Advances in technology allow these stories to grow richer with details and better understanding. Increasingly, the public is able to share in the experiences of scientific explorations through the use of ship-to-shore online communication and the Web. In mid-June 2003, almost 27 years after Rona and colleagues took the first pictures of what may be signs of a living fossil relative of Paleodictyon, this mystery and other fascinating stories from the oceans depth will debut on a large-format IMAX screen. After more than 10 years in the planning, the film Voyage into the Abyss is scheduled to hit IMAX theaters around the world beginning next fall. Researchers prepped the Woods Hole Oceanographic Institution's Alvin submersible for recovery after a dive in the Pacific. Cameramen record the action for the IMAX movie Voyage into the Abyss. Photo courtesy of The Stephen Low Company. During the IMAX filming of the R.M.S. Titanic in 1991, the team of scientists and filmmakers envisioned an IMAX exploration of hydrothermal vents. Leaders in the oceanographic community supported the idea of an IMAX film for many years. They emphasized to the National Science Foundation (NSF) the films potential to showcase deep-sea research to the public and provide the scientific community a never-before-attempted opportunity to film large-format IMAX imagery and high-definition television (HDTV) under unparalleled lighting conditions. But it was Richard Lutz of the Institute of Marine and Coastal Sciences at Rutgers State University who committed scientific dives to the project and stepped forward as the science director. On the Alvin, we ended up using 10 smaller lights instead of four big ones and installed new booms to get the lights high and far out into the water column, Low says. Outside the submersible, Alvins lights were moved onto two double-articulating booms. When fully extended, the booms measured more than 6 meters, making the sub difficult to maneuver, says pilot Pat Hickey. 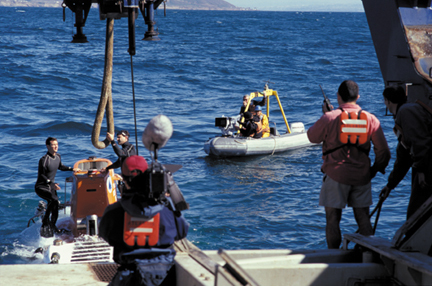 The lighting technology developed for the shallow, underwater sets on James Camerons 1989 movie The Abyss raised the bar for underwater photography. Rather than standard fluorescent or incandescent lights, Cameron had relied heavily on mercury-halide discharge lamps called Hydragyrum Medium arc-length Iodide, or HMI, which are four times more powerful. But their watertight casings were made for depths around 20 meters. Low modified the casings and lights for his 1992 IMAX documentary of the R.M.S. Titanic. When Cameron went to shoot Titanic the movie, Low in return lent him the modified lights capable of 4,000-meter depths. Or, as Low says, its the difference between lighting the Houston Astrodome or lighting a small bathroom. The dive proved successful and in January 2001, NSF agreed to fund Voyage into the Abyss. The biggest challenge was raising the funding, says Alex Low, executive producer and marketing director for his brothers company. The film cost $7 million plus a million dollars in dive time, so, on the whole, $8 million. NSF provided approximately $2 million of that, he says. Rutgers provided another $1.5 million. Additional support came from the New England Aquarium in Boston, and from The Stephen Low Company. The team moved on to the Atlantic where the TAG, Lost City and Snake Pit hydrothermal vent fields awaited. From the Pacific dives they knew some additional equipment would be needed to help the Alvin pilots. To fit through Alvins hatch, the IMAX camera needed to be disassembled and then reassembled during descent. Installing the 150-pound camera into Alvin took up the room of one person in a submersible made for three. This squeeze left just enough space for a pilot and a cameraman. Unfortunately for the pilot, the camera lens looked directly out the front porthole intended for navigating. And coincidently both the porthole and lens were the same size  about 4 inches in diameter. At first Bill [Reeve, director of photography] and I shot some rock walls and a giant anemone while I figured out how to drive Alvin looking out the side window, instead of the front, Williams says of his dive in the Pacific. The light booms stuck way out and getting used to just where they were in relation to what I could see took a can of film or two. To compensate for the lack of visual perception out the front, three small video cameras were attached on the outside of the submersible that sent a panoramic view to three small LCD (liquid crystal display) monitors inside. In the summer of 2001, the Alvin dove 16 times along the Mid-Atlantic Ridge and twice revisited the TAG hydrothermal field where the mysterious pattern was first caught on film in 1976. In order to catch the details of the surface form, Rona, who has worked at Rutgers since 1994, and National Geographic photographer Emory Kristof left the IMAX camera on board the R/V Atlantis and dove with a pilot of the Alvin to film the pattern using the Woods Hole HDTV camera, which captures close-up images. Although the IMAX camera is best for vista shots and the panoramas of the vents and their communities, Woods Hole collaborated with IMAX to record the shrimp eyes and other close-ups with HDTV. Under the extra bright lights and in close-up detail, the surface relief of the mysterious Chinese checkerboard-like forms appeared in clear view with nobs of sediment piled between definite holes, which had before seemed somewhat ambiguous. The new data about the nobs of sediment between the holes sent Seilacher into thrills of excitement. He suspects the patterns are from a submerged tunnel system that acts like a garden of bacteria for whatever creature made it. Although past core studies of this material turned up negative for organic material, Seilacher thinks that the holes act as sinks for the water flow above the pattern and the nobs represent the areas where the sediment has circulated out of the hypothesized sub-seafloor, chicken-wire meshwork of tunnels. What we find in the fossil record is not tunnels, but casts of them, he says. In the modern analog, now we have the interesting detail of the sediment surface. But just what created this pattern remains aloof from the lights of Alvin. Reed is associate editor of Geotimes. E-mail her at car@agiweb.org.